It's been a while since the last giveaway, so why not today? I'll be giving away these nine matched volumes of Scott's 'Waverly Novels.' These books were put out by Colliers around 1900 or so. Nice frontispiece illustrations, bindings are tight, pages are bright. Comment below to enter, or let me know on Twitter or Facebook. I'll announce a winner tomorrow afternoon (March 3rd) at 3:00 PM EST. I'd love to see illustrations in these - I love old novels. Just beautiful!! Enter me in the give away!! Thanks! Lovely covers. Enter me please. All we have to do is comment to enter? Well, then, consider me entered! Those covers are beautiful, they'd be a wonderful addition to anyone's library! I would shelve those and LOVE THEM! They look great - would love them! Beautiful! I would LOVE to give these guys a home! A shame only the spines show between bookends when the covers are such gems! Guess I'll just have to display them like you have here! Enter me, please, and thanks for sharing such a marvelous set! Oh! A wonderful giveaway. I managed to miss reading the Waverly novels, so I'd love to win these. What beautiful (and intriguing) books! Thanks for offering them! How lovely! 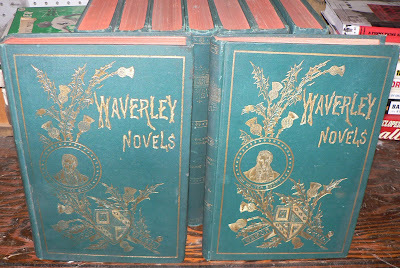 My sweetie still laments the loss of a set of Waverly novels, and I'd love to give these to her. Jaeyde - I lived in PDX for a year, and Powells really dominates the book market. It's funny, it's the best bookstore in the country, and yet Portland could really use a few good shops. They are not too far out in SE. Good luck. Beautiful books! Thank you for the chance to win them! I would like these for my very own! Sure, I'm in, why not? I love your site! I'd love to win them. I'd love to win these Scott books. Beautiful books. Love your blog! There was an identical set of these in an old pub I used to frequent in Edinburgh - albeit more nicotine-stained and shabby looking! Wow, 1900? I love books like those. Cool, I'm in please! oh my; I go weak in the knees when I see such lovely, old book covers. It seems so elegant compared to the blank-covers-with-dust-jackets of today. Thanks for such a great giveaway! I'd love to give these books a home. Thanks for entering my name. Awesome, I'd be interested to read them, & they're beautiful! Just stumbled upon your blog thanks to a.wray, who won the last contest -- very cool! My brother in law went to SUCO & family lives near you. Oh my goodness - I think I will have to hunt down a set of these somewhere: it's my partner's birthday; Scott is his writer's-routine-hero; and that blue is so blue! Here I am, loving those books! Beautiful books.. please enter me! oh, i'd love one... they look amazing! Great books. Please enter me. I like the covers, would love to be entered. Wow, what an amazing prize. Consider me entered! Beautiful books. I'd love to enter please. Sign me up, they're beautiful! Wow, oh wow. Please enter me. Thank you!